Home renovation loans are ideal for the homeowner who has lived in a neighborhood they love in their perfect home for several years, but wants to improve or expand the house even more. A home renovation loan could also be the solution for a new home buyer who sees a home they like, but wants to update or personalize it to meet their family’s needs and wants. Refinancing the current mortgage on the home. Often, homeowners are at an advantage by refinancing when rates are lower than when they first bought the home. Opening a home equity line of credit. With this option, the borrower has a certain limit which can be used as needed to make repairs or improvements. These types of home renovation loans come with the benefit that interest does not have to be paid on the unused portion. A home equity loan involves borrowing a fixed amount and repaying over time. On average, the terms are about 15 years, but can range from two years to thirty years. Construction loans are used for larger projects like building a home or major renovations on an existing home. These home renovation loans are suited for projects such as building additions on the home or other improvements which cost more than the equity the homeowner has in the home. For homeowners who decide against home renovation loans, there are other means to get financing to improve or repair their home. Some borrowers take money from their 401(k) retirement account in the form of a loan, plus interest, that is paid back into their account over a period of time. Another option for money is contractor financing, in which the contractors connect borrowers with financing companies to pay for the renovation. This type of financing can cost more in fees and interest than other loans. Credit cards are sometimes used to cover the cost of smaller renovations. In some cases, the homeowner will use the credit card to purchase materials that are needed, and use other financing for the actual renovation work. Homeowners must take reasonable caution when it comes to home renovation loans. Home equity loans and equity lines of credit may let borrowers get up to 90 percent of their equity. However, they also come with closing and other costs, and can result in the loss of the home if not repaid. Therefore, it is in the best interest of the homeowner to carefully weigh out whether the renovation is affordable or if it can wait until a later time. Don’t take out long term home renovation loans for short term projects. For instance, taking out a 30-year loan for painting the house is not only expensive, the house will have to be painted several times more while the homeowner is paying for the first paint job. If the homeowner is refinancing their mortgage for renovations, they should consider a shorter term (like 25 years instead of 30) for repayment to accelerate the payments. Making extra payments on the principal will also pay off the loan more quickly. Get a complete understanding of the terms of all types of loans. For instance, borrowing against a retirement account means that if the homeowner leaves their job, the balance becomes due immediately. Construction loans are short-term. Money is released when various stages of the work are finished. They are refinanced into traditional mortgages once the renovation or construction is complete. Consumers that are buying a home that needs renovation should get a renovation, rather than traditional, mortgage. 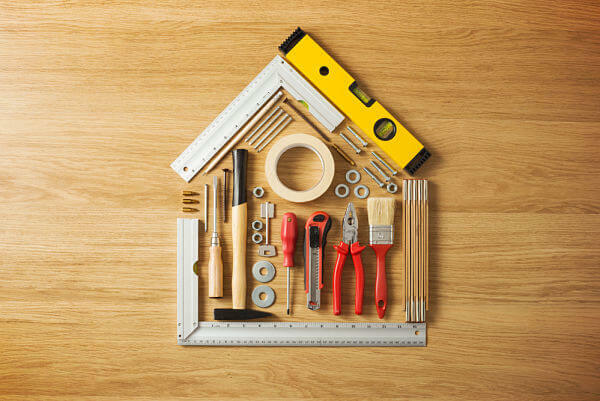 Renovation mortgages build the cost of repairs into the total amount of the loan. A fabulous chef’s kitchen is a dream come true for homeowners. So is a modern spa-like master bath suite and large swimming pool. While these renovations may delight the residents of a home, it is a good idea to consider what a potential buyer will want most if the home sells. Curb appeal items like landscaping, porch steps, and the front door. A professional paint job inside and out. Repairs like faucets, door knobs, creaky floors, sticky doors. Roof, HVAC, plumbing in excellent shape. Some real estate professionals estimate that siding, windows, and kitchen remodels get the most return on the homeowner’s investment. Bathrooms come next, especially with modern, natural finishes and lots of space. When it comes to home renovation loans, the wise homeowner chooses refinancing their first mortgage if the current one has higher interest. Other points to consider with home renovation loans is whether the homeowner plans to stay in the home for a while or sell in the near future. Lastly, it is very important to plan carefully in order to avoid running out of money before a renovation is complete, since homeowners may not be eligible for other home renovation loans until the home is made livable.